The above cited categories of alkaloids shall now be discussed separately here under. * F.L. Pyman J. Chem. Soc. 101, 2260 (1912). Biological Source It is the toxic principle of poison Hemlock, Conium maculatum L. (Umbelliferae). It is found in the seeds of Cicuta maculata L. (Apiaceae) (Water Hemlock). It occurs naturally as the (S)–(+) isomer. Isolation It is isolated by standard procedures described earlier from the pitcher plant Sarracenia flava*. 1. The powdered Hemlock fruits are mixed with KOH solution and then subjected to steam distillation. The distillate thus obtained is neutralized and evaporated to dryness. 2. The resulting residue is extracted with ethanol successively, filtered and the solvent evaporated under vacuo. The ethanol extracts the alkaloidal salts that are dissolved in water, which is subsequently rendered alkaline with KOH solution and finally extracted with ether at least 3-4 times. 3. Ether is evaporated under vacuo, when an oily liquid comprising of the free bases remains as the residue. 4. The fractional distillation of the oily liquid under vacuo or in a current of hydrogen gas, separates them into coniine and γ-coniceine at approximately 171-172°C. These two alkaloids are converted to their corresponding hydrochlorides, evaporated to dryness and extracted with acetone. Thus, coniine hydrochloride will be obtained as the insoluble substance, while the coniceine hydrochloride shall remain in acetone and recovered separately. Note: Coniine enjoys the distinction of being the first ever alkaloid prepared synthetically. 1. It is a colourless alkaline liquid, which darkens and polymerizes on exposure to light and air. 2. It has a typical mousy odour. 3. It has mp ~ – 2°C, and bp 166-166.5°C; bp20 65-66°C. 4. It is a steam-volatile substance. 5. Its physical parameters are: d420 0.8440-0.848; nD23 1.4505; [α]D25 +84o (C = 4.0 in chloroform); [α]D23 +14 6o (neat) and pKa 3.1. 6. Solubility: 1 ml dissolves in 90 ml of water, and less soluble in hot water. The base dissolves about 25% of water of ambient temperature. It is freely soluble in ethanol, ether, benzene, acetone and amyl alcohol; and slightly soluble in chloroform. 1. Coniine Hydrobromide Derivative (C8H17N . HBr): Its prisms have mp 21°C ; 1 g dissolves in 2 ml water, 3 ml ethanol, and freely soluble in ether and chloroform. 2. Coniine Hydrochloride Derivative (C8H17N. HCl): It occurs as rhomboids having mp 221°C, freely soluble in water, chloroform and ethanol. (R)-(–) Form: It is a liquid, bp756 165°C; [α]D25 -81o (C = 4.0 in chloroform); [α]D23 -14 2 o(neat). (±)-Form: It has bp 200-210°C. 1. It has been used in convulsive and spasmodic diseases, such as: asthma, chorea, epilepsy, pertussis and tetanus. 2. Coniine has also been recommended is carditis, delirium, glandular swellings, jaundis, mania, nervous diseases, neuralgia, rheumatism, spasms and ulcers. Biological Sources It is obtained from the herb and seeds of Lobelia inflata L., (Lobeliaceae) (Indian Tobacco, Asthma Weed); leaves of Lobelia tupa L. (Campanulaceae) (Tupa, Devil’s Tobacco). 1. The powdered lobelia herb is moistened with water, acidified slightly with acetic acid and left as such for 3-4 hours. The resulting mass is then pressed and the process of moistening and pressing is repeated subsequently. 2. The acidic solutions thus collected are mixed and rendered alkaline with sodium bicarbonate carefully. The alkaline solution is extracted with ether successively. For purification, the etherial extract is shaken with water, acidified with dilute sulphuric acid. The acidified liquid is again rendered alkaline with sodium bicarbonate solution and shaken with ether. 3. The combined ethereal extract is evaporated and the yellow oily liquid, comprising of the total alkaloids, is dissolved in water, acidified with HCl, filtered and then shaken with chloroform successively. Thus, the chloroform will exclusively extract the lobeline hydrochloride, while leaving the salts of the other alkaloids in the aqueous layer. The chloroform is then evaporated under vacuo to obtain the brownish oily residue. 4. The above residue is then taken up with double its volume of hot water at 80°C. The aqueous solution is kept in a vacuum desiccator over concentrated H2SO4 for several hours when lobeline hydrochloride separates out as crystals. 5. To recover the lobeline base, the resulting HCl salt is dissolved in warm water, rendered alkaline with dilute NaOH carefully and extracted with ether several times. The ethereal extract is evaporated and the residue is recrystallized from ethanol or benzene. 1. Lobeline is obtained as needles from ethanol, ether and benzene having mp 130-131°C, and specific rotation [α]D15 -43o (ethanol). 2. It is freely soluble in chloroform, ether, benzene and hot ethanol; and very slightly soluble in water and petroleum ether. 1. Colour Test: Lobeline on the addition of a few drops of concentrated sulphuric acid followed by a drop of formalin solution gives rise to a distinct red colouration. 2. Froehd’s Test: It produces an instant rose red colouration with Froehd’s Reagent that ultimately changes to blue. 3. Erdmann’s Reagent: It develops a faint green colour which intensifies on slight warming. 4. Lobeline Hydrochloride (C22H27NO2.HCl) (Lobron, Zoolobelin): It is obtained as rosettes of slender needles from ethanol with mp 178-180°C; [α]D20 -430 (C = 2); and uvmax (methanol) 245, 280 nm (log € 4.08, 3.05). Its solubility profile is as follows: 1 g dissolves in 40 ml of water, 12 ml of ethanol, very soluble in chloroform and very slightly soluble in ether. A 1% (w/v) solution in water has a pH of 4.0-6.0. 5. Lobeline Sulphate [(C22H27NO2)2.H2SO4] (Lobeton, Unilobin, Bantron, Toban, Lobidan): Its crystals obtained from ethanol exhibits specific rotation[α]D20 -25o (C = 2). It is soluble in 30 parts of water and slightly in ethanol. 1. It is widely used as a respiratory stimulant. 2. Its effects resemble those of nicotine and hence used in lozenges or chewing tablets, containing 0.5-1.5 mg of Lobeline Sulphate, to help in breaking the tobacco habit, otherwise known as ‘smoking deterrants’. 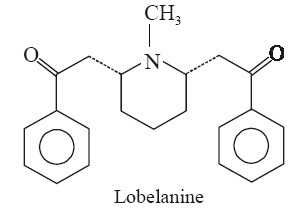 Biological Source After lobeline, lobelanine is obtained as the most abundant alkaloid of Lobelia inflata L. (Lobeliaceae). (Indian Tobacco, Asthma Weed). cis-2, 2’-(1-Methyl-2, 6-piperidine-diyl) bis [1-phenylethanone], (C22H25NO2). Isolation The aqueous layer obtained in step (3), as stated under isolation of lobeline, is subjected to column chromatography and the lobelanine is collected as one of the major fractions. 1. It is obtained as rosettes of needles from ether or petroleum ether having mp 99°C. 2. It is freely soluble in acetone, benzene, ethanol, chloroform; and slightly soluble in water and ether. 1. Lobelanine Hydrochloride (C22H25NO2.HCl): The crystals obtained from dilute ethanol decomposes at 188°C; it is soluble in chloroform; and slightly soluble in absolute ethanol and cold water. 2. Lobelanine Hydrobromide (C22H25NO2.HBr): The crystals do not give a sharp mp, but gets decomposed at 188°C. 3. Lobelanine Nitrate (C22H25NO2.HNO3): The crystals obtained from dilute ethanol has mp 153-154°C. 4. If differs from Lobeline in lacking OH moiety; and therefore, does not react with nitrous acid nor with benzyl chloride. 5. It being a diketonic compound-forms a dioxime. 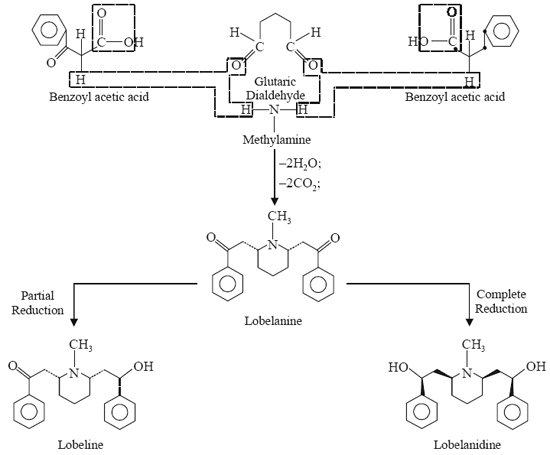 Biological Source It is same as that of lobelanine. [2α(R*), 6α(S*)-Methyl-α,α-diphenyl-2, 6-piperidine-diethanol (C22H29 NO2). Isolation It is obtained as one of the fractions obtained from the column chromatography of the aqueous extract from step (3) under isolation of lobeline. 1. It is obtained as scales from ethanol with mp 150°C. 2. It distils unchanged in vacuo. 3. It is freely soluble in benzene, chloroform, acetone; slightly soluble in ether, petroleum ether; and almost insoluble in water. 1. Lobelanidine Hydrochloride (C22H29NO2 . HCl): It is obtained as needles from ethanol having mp 135-138°C. 2. Lobelanidine Hydrobromide (C22H29NO2.HBr): Its crystals have a mp 189°C. (b) Lobelanidine: On being subjected to complete reduction. All these reactions are summarized as given below. 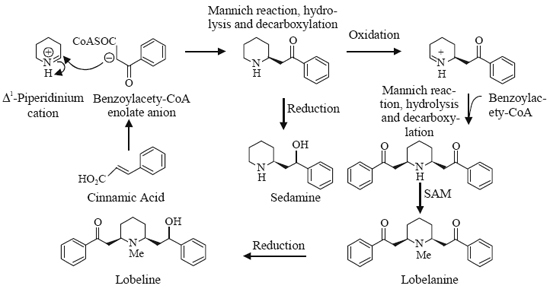 Mannich reaction. Thus, oxidation of the piperidine ring brings forth a new iminium species that can react further with a second mole of benzoylacetyl-CoA, again via Mannich reaction. 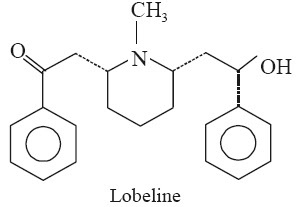 Both lobeline and lobelanine are the resulting products obtained from further N-methylation and/or carbonyl reduction reactions. Biological Source It is obtained from the dried unripe fruit of Piper nigrum L. (Black Pepper), Piper longum L., Piper retrofractum Vahl. (Piper officinarum C.D.C. ), and Piper clusii C.D.C. ; and also in the root bark of Piper geniculatum. Sw. belonging to family Piperaceae. (E, E)-1-[5-(1, 3-Benzodioxol-5-yl)-1-oxo-2, 4-pentadienyl] piperidine (C17H19NO3). Isolation The dried unripe fruits are extracted with ethanol in a Soxhlet apparatus till extraction is complete. The solvent is evaporated under vacuo in a Rotary Thin Film Evaporator. The residue of the alcoholic extract is digested with dilute alkali to affect saponification, when piperine remains unaffected. The residue, thus obtained is decanted and washed with distilled water several times. The resulting product is dissolved in hot ethanol and on cooling the crystalline piperine separates out. 1. Piperine is obtained as monoclinic prisms from alcohol having mp 130°C. 2. It is tasteless at first, but has a burning aftertaste. 3. Its dissociation constant pK (18°C) is 12.22. 4. Solubility Profile: 1 g of piperine dissolves in 15 ml ethanol, 1.7 ml chloroform, 36 ml ether; freely soluble in acetic acid and benzene; and almost insoluble in water (40 mg/L at 18°C), and petroleum ether. 1. Wagner’s Reagent Test: The addition of Wagner’s reagent to an alcoholic solution of piperine gives rise to bluish needle like crystals having mp 145°C. 2. Platinum Chloride Test [H2PtCl6]: Piperine on treatment with platinum chloride solution (0.5% w/v/) produces an instant orange red colouration, which upon standing gives needles of piperine-H2PtCl6. 3. Piperine reacts with a few drops of concentrated sulphuric acid yields a distinct red colouration. 1. It is used as an insecticide. 2. It is also employed extensively as condiment in food preparations. 3. It is used to give a ‘pungent’ taste to brandy. Biosynthesis of Piperine In the biosynthesis of piperine, the piperidine ring forms part of a tertiary amide moiety which is incorporated via piperidine itself i.e., the reduction product of D1-piperideine as shown under. Interestingly, the piperic acid residue in obtained from a cinnamoyl-CoA precursor. The extension of chain is caused by virtue of acetate/malonate and ultimately combines as its CoA-ester with the previously obtained piperidine nucleus. 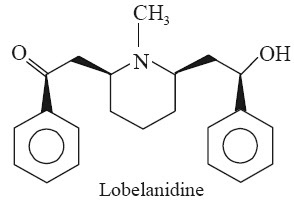 The quinolizidine alkaloids comprise of lupinine, lupanine and sparteine which are responsible for the toxic properties are characterized by a quinolizidine skeleton. The bi-heterocyclic nucleus is closely related to the ornithine-derived pyrrolizidine system, but is believed to be formed from two molecules of lysine. 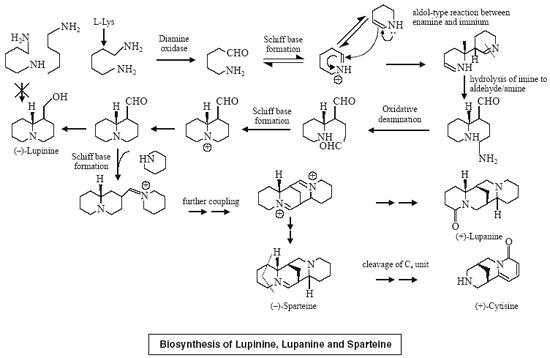 Biological Source The naturally occurring l-form is obtained from the seeds and herb of Lupinus luteus L. and other Lupinus species belonging to the natural order Lequminoseae; and also found in Anabasis aphylla L. (Chenopodiaceae). Isolation The isolation of lupinine from the seeds and herb of Lupinus lutens may be affected by the method evolved by Couch* (1934). 1. Lupinine is obtained as stout orthorhombic prisms from acetone having mp 68.5-69.2°C. 3. It is soluble in water, ethanol, ether and chloroform. 4. It is a strong base. 1. l-Form Lupinine Hydrochloride Derivative (C10H20ClNO): Its orthorhombic prisms have mp 208-213°C, and [α]D –14°. 2. dl-Form Lupinine: The crystals obtained from acetone have mp 58.5-59.5°C. Biological Source It is obtained from the herb of Genista tinctoria L. (Fabaceae) (Dyer’s Broom). (7α, 7aα, 14α, 14aβ)-Dodecahydro-7, 14-methano-2H, 11H-dipyridiol [1, 2-a: 1’, 2’-e] diazocin-11-one; (C15H24N2O]. dl-Lupanine: It is obtained as orthorhombic prisms obtained from acetone having mp 98-99°C; bp1.0 185-195°C; It is soluble in ethanol, ether, chloroform and water; and insoluble in petroleum ether. d-Lupanine (Synonym: 2-Oxosparteine): It is obtained as syrup crystallizing difficultly in hygroscopic needles having mp 40-44°C; bp3 190-193°C; nD24 1.5444; [α]D25 +84o (C = 4.8 in ethanol). It is found to be freely soluble in water, ethanol, ether and chloroform. l-Lupanine (Synonym: Hydrorhombinine): It is a viscous liquid having bp1.0 186-188°C; [α]D - 61o in acetone. Identification Test Lupanine forms the corresponding lupanine hydrochloride dihydrate (C15H24N2O.HCl.2H2O) which is obtained as rhombic crystals from water having mp 127°C (dry). * Couch, J.F., J. Am. Chem. Soc., 56, 2434 (1934). Biological Sources It is obtained from yellow and black lupin beans Lupinus luteus L., and Lupinus niger Hort. ; and also found in Cytisus scoparius (L.) Link. (Fabaceae) (Scotch Broom); Anagyris foetida L., belonging to natural order Leguminosae. Besides, it is also obtained from the roots of Aconitum napellus L. (Ranunculaceae) (Aconite, Monkshood, Blue Rocket); from the herbs of Chelidonium majus L. (Papaveraceae) (Celandine, Great Celandine, Nipplewort); from leaves of Peumus boldus Molina (Monimiaceae) (Boldo). [7S-(7α, 7aα, 14α, 14a β]-Dodecahydro-7, 14-methano-2H, 6H-dipyrido [1, 2-a: 1’, 2’-e] [1, 5] diazocine, (C15H26N2). Isolation It is isolated from yellow and black lupin beans by the method put forward by Clemo* (1949). 1. It is a viscous oily liquid having bp8 173°C. 2. It is volatile with steam. 3. Its physical parameters are: [α ]D21 -16.4o (C = 10 in absolute ethanol); nD20 1.5312; d420 1.020; pK1 at 20°C : 2.24; pK2:9.46; pH of 0.01 molar solution is 11.6. 4. Solubility profile: It is freely soluble in ethanol, ether and chloroform; and 1 g dissolves in 325 ml of water. Tocosamine) It is obtained as columnar crystals which loses water of crystallization at 100°C turning brown and ultimately gets decomposed at 136°C. The pH of a 0.05 molar solution is 3.3. It is practically insoluble in ether and chloroform, and 1 g dissolves in 1.1 ml of water, 3 ml of ethanol. 1. It is used mostly as an oxytocic. 2. It is employed as a cardiac depresant, cathartic, diuretic and for stimulating uterine contractions. 3. Sparteine is used occasionally as a quinidine substitute in stubborn cases of atrial fibrillation. cadaverine. Thus, the proposed pathway given below suggests coupling of two such molecules. In fact, the two tautomers of ∆1-piperideine, as N-analogues of corresponding carbonyl compounds, are in a position to couple by an aldol-type mechanism. In reality, this coupling takes place in solution at physiological pHs, although the stereospecific coupling as shown in the proposed pathway shall evidently require the participation of suitable enzymes. After coupling, the imine system gets hydrolyzed, the resulting primary amine function undergoes oxidation, and ultimately the formation of the quinolizidine nucleus is accomplished by Schiff base formation. Thus, lupinine is then synthesized by two further reductive steps. Hence, the pathway to sparteine and lupanine eventually requires participation of another molecule of cadaverine or ∆1-piperideine. Biological Source It is obtained from the seeds of the Australian leguminous tree Castanospermum australe A. Cunn. (Leguminosae) (Moreton Bay Chestnut). [1S-(1α, 6β, 7α, 8β, 8aβ]-Octahydro-1, 6, 7, 8-indolizinetetrol; (C8H15NO4). It is a polyhydroxy alkaloid. 1. The crystals obtained from aqueous ethanol have mp 212-215°C (decomposed). 2. Its specific optical rotation is [α]D25 +79.7o (C = 0.93 in water); and dissociation constant pK 6.09. Uses Its has demonstrated activity against the AIDS virus HIV, by virtue of their ability to inhibit glyosidase enzymes involved in glycoprotein biosynthesis. However, the glycoprotein coating seems to be vital for the proliferation of the AIDS virus. Biological Source It is obtained from the plant Swainsona canescens (Leguminosae/Fabaceae). [IS-(1α, 6β, 7α, 8β, 8aβ)-Octahydro-1, 2, 8-indolizinetriol; (C8H15NO3). 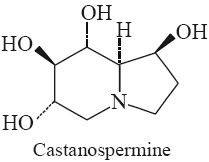 Biosynthesis of Castanospermine and Swainsonine These two alkaloids are regarded as a hybrid between the pyrrolizidine and quinolizidine alkaloids. It is, however, pertinent to mention here that these two alkaloids though are derived from lysine, yet their origin entirely deviates from the usual and common lysine-derived moieties in that L-pipecolic acid is found to be an intermediate in the pathway. In fact, there are two established routes known to the formation of pipecolic acid in nature, as shown below; wherein the point of difference solely based on whether the N-atom is taken-up either from the α- or the €-amino portion of lysine. 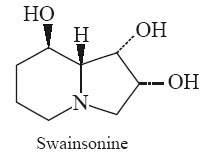 * Also a branch point compound results into the formation of swainsonine that essentially possess the opposite configuration at the ring fusion.